Hello Blogger Friends! There is no YouTube review up for this book yet, but there will be soon! You see, I am currently battling a rather nasty cold. How nasty, you ask? It got so bad that last Sunday I couldn’t hold anything down and my wonderful fiance had to wrap me up in blankets and take me to the emergency room. I still have the coughs and sneezes now, but I have meds and I am on the mend! As soon as I am able to speak without hacking, I will be posting the Part 2 video of my Christmas Book Haul and a video review for this book. However, since I also post book reviews on my Goodreads account, I figured I could post that review up here. So all my WordPress friends could get a “sneak peek” before the video. Here we go! Even though this is probably not going to be one of my favorites by King, I still have to admit that I consider it to have been a milestone to read. This is not only because of its rather large length, but also because I read half of it while (and still) battling a nasty cold. The cold made the duration of this novel stretch out into an entire month, right down to the very day. I don’t think Dreamcatcher is one of Stephen King’s best, however I still found myself enjoying it in various sections. I loved the beginning, the middle ran rather slow, and the ending picked me up again. I also found myself enjoying the parts centering around the friendship of Beaver, Henry, Pete, Jonesy, and Duddits, a lot more than learning about the various military persons involved in the story. Perhaps King made the villains a little too unlikable, to the point where I couldn’t stomach the paragraphs involving them. Even though the centering friendship of the story was my favorite bits, their overall purpose of the story did confuse me. Yes, they saved the world. But I still don’t really get how some of the mechanics of the “Duddits Dreamcatcher” worked. Dreamcatcher definitely made me feel a bit stupid, as some of the telepathy elements seemed forced into the plot a bit. Overall, the story of five average guys befriending a telepathically gifted boy with Down’s Syndrome and later using his gifts to save the world from aliens, does seem a bit far fetched. But I think this novel is worth the read just to see how Stephen King crafted these beautiful relationships between his main characters. But this book is not for the faint of heart. The blood does poor and the body count is high. I gave this novel 3/5 stars on Goodreads. In this video, I review Dash and Lily’s Book of Dares by Rachel Cohn and David Levithan. 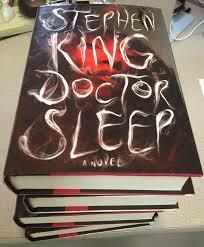 The first time I saw Doctor Sleep on the shelves of my local Books-a-million, I was overtaken by such joy at seeing a sequel for the Shining. I always loved the character that is Danny Torrance. Taking that as a sign, my boyfriend purchased the large hardback for me as a Christmas gift. College life kept the novel at bay from me for a while, and it wasn’t until now that I was finally able to put my hands on it. If you have read the Shining or have seen the Kubrick film, you would know that Jack Torrance (Danny’s father) was an alcoholic. We see in Doctor Sleep that Danny has followed in his footsteps. Alcoholics Anonymous terms and rituals are used heavily in the novel, which I think was used very well. We follow Danny on his road to recovery and to him discovering some things about himself. I found myself loving our newest “Shining” character, Abra. I thought she was quite spunky, likable, and believable. Best line: “They ate his shining???! Like Twilight?? !” As for the baddies in this King novel, Rose O’Hara was a great character. She was a perfect combination of cruel, seductive, and ruthless. O’Hara leads the “shining devouring” group known as the True Knot. The True Knot are those old people tourists you always see on the road that drive in campers and wear Hawaiian shirts and fanny packs. You would never expect it, but they prey on children with the shining, it keeps them young. I found the other members of the Knot to be very interesting as well. I mean with names like “Apron Annie,” “Token Charlie,” “Crow Daddy,” and “Snake-Bite Andi,” would you expect less? My only problem with the novel was I found it more on the suspense than the scare factor. Scary is what I look for when it comes to King and while I found O’Hara to be a great villain, she kept me on the edge of my seat more than under my blanket. Despite that the novel was very well written and the plot was great. If you loved the Shining or you love King definitely give it a look. I rated this book on Goodreads 4 out of 5 stars.